Re-opened as The Star by Hackney Downs, same owners as The Stars in ?King's Cross and Bethnal Green. Sadly the decorators were still at work yesterday at 3:30pm, the opening wasn't until 6pm. Next time I'll give it a go. 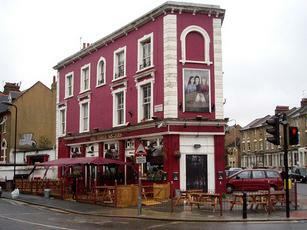 This is a simple triangular pub that has some picnic tables outside and is located on the corner of a busy junction. The Pride was off during my visit leaving only a standard draught selection, but the Guinness was very nice. The pub isn�t the biggest, but there is a small pool table in front of a small stage area that had some decks set up on it and there is also table football and a nice dartboard. I got the feel that it was very much a local�s pub, but they along with the barmaid seemed like a nice enough bunch. I spotted three plasma screens, but saw no sign of any sport advertised, but I would have thought they have Sky Sports or there wouldn�t really be any point in the screens. I found this place to be fairly unremarkable, but I�d pop back in for a quick pint if passing. I like this pub -- I think it might have been taken over by a new family last summer and they're always really happy to see you and gave us free sweets and offered us board games and had barbeques on sunny weekend afternoons. It has a pool table too which isn't the best but is OK. When you get wine it's those little individual bottles but they're really cheap, the Magner's is cheap too. It has a really nice deck outside that's at an especially brilliant Hackney cross roads for hearing great music coming out of passing cars with bass noise shaking them. I just overdosed when i first found it and went here too much. It has a brilliant pub sign too. Scruffy family pub with tables outside where you can sit in the sun by Hackney Downs park. Great.